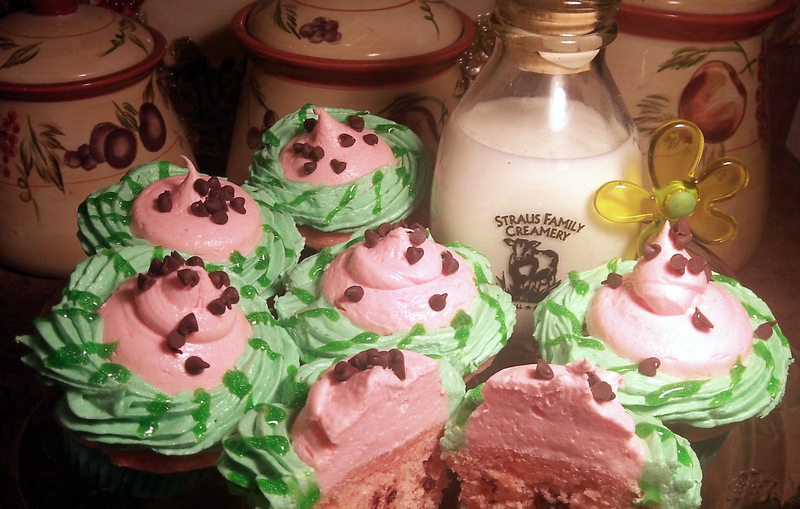 Watermelon Fairy Cakes– Summer time in a Cuppie! There are many versions of these little fairy cakes or cuppies floating around, but this recipe is one of many that I fused together. I wanted real watermelon flavor to present itself—not an artificial metallicy imitation. I wanted them to be quick, I wanted them to be pretty and most importantly, wanted them to be delicious. My Watermelon Cuppies are light, airy, flavorful deliciously moist and offer a gentle watermelon taste that’s definitely there, but not overwhelmingly. Please remember to “reserve” the tablespoon of jello for the pink frosting, so the sweet melony goodness carries on until the last sweet, scrumptious bite. 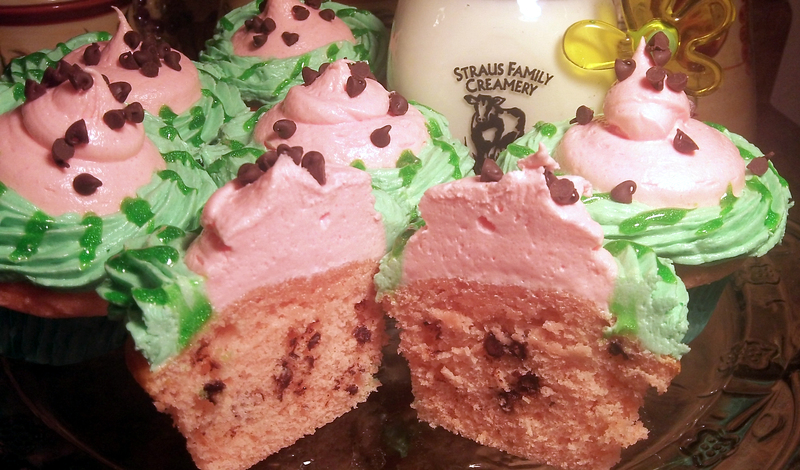 If you’re a watermelon fan, you’ll want to find the “print” button below for this one–these cuppies are delightful! Just like Summer time, but in Cuppie form! RESERVE 1 Tbsp. dry gelatin mix. Prepare cake batter as stated on package for 24 cupcakes, blending remaining gelatin and 3/4 cup of mini morsels mix into batter before spooning into prepared muffin cups. Bake in preheated oven for 14-16 minutes. Cool on wire rack for 5 minutes. Remove cupcakes from tin and cool completely before frosting. Using the wire whisk attachment of your mixer, whip butter on medium-high speed for 5 minutes, stopping to scrape bowl once or twice. Reduce speed to low and gradually add powdered sugar. Once all of the powdered sugar is incorporated, increase speed to medium-high and add vanilla and cream or milk, mixing until incorporated. Whip at medium-high speed until light and fluffy, about 2 minutes, scraping the bowl as needed. Divide frosting in half; color one red and one green. Whip 1 tablespoon of reserved jello into red frosting. I’m not a pastry chef, but am getting better; Imagination, inspiration and motivation are key elements in all art-forms 🙂 Pipe or spoon centers with pinkish red frosting. Sprinkle mini morsels on top. Pipe or spoon outside edges with green frosting. Green gel (as shown) can be piped around green frosting to resemble melon rind.